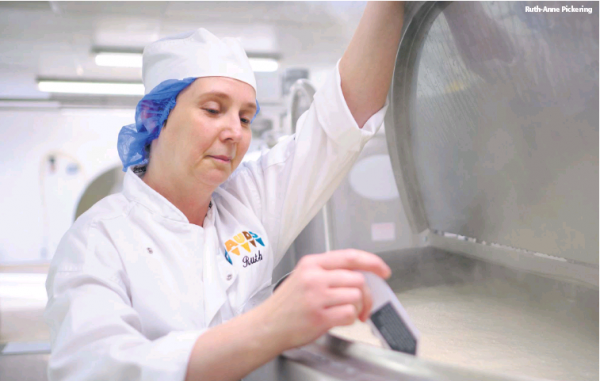 A part-time job turned into a lasting career for ice cream maker Ruth-Anne Pickering. I started working in Mauds Ice Creams part-time while still at school. I began serving ice cream behind the counter before moving on to making ice cream at the Mauds’ factory in Carrickfergus. From there, I worked my way up to supervising the day-to-day production and I am currently responsible for pasteurising the ice cream mix. I trained to become a chef at the College of Business Studies Belfast. I also trained as a medical secretary but left before I completed the course – office work was not for me. It just happened – I was asked would I like a job, I accepted and now, almost 33 years later, I’ve never looked back. Working in the food industry was always my goal, I was so fortunate to end up on the yummy side of things! Not at the time, however the training I undertook gave valuable insight into food safety and hygiene practices. My training is ongoing with courses related to my field of employment. Really it is best to start at the bottom and learn the skills for all the positions. This gives valuable insight on the importance of all stages of the ice cream manufacturing process. Teamwork is as essential as being able to work independently. Strong problem-solving skills, adaptability and a sense of adventure is also very important. A willingness to try new and exciting flavours is useful! A typical day starts with a complete hygiene check to ensure all equipment is working correctly and cleaned thoroughly from the previous day’s production. The next job is checking the intake of the fresh milk and cream, which are added to the pasteurising tank and heated before blending in the rest of the ingredients. The batch of now liquid mix is heated to 72.4 degrees and held for 10 minutes to pasteurise. The hot mix is then passed through a filter to ensure any unwanted debris, if present is removed. From here, it is directed to the homogeniser where the fats are forced under high pressure through a small opening. This ensures the finished product is smooth and creamy and maintains good texture. Finally, the liquid mix is cooled and stored in containers where the ageing process begins. This allows the flavour to develop and the milk fat to partially crystallise, giving the protein stabilisers time to fully hydrate. All stages of the process are monitored, checked and recorded continually. After production is complete, the plant needs to be cleaned down and sterilised for the next day of production. We continually test and taste the ice cream, so I personally feel the biggest challenge is not to eat too much ice cream – is there such a thing as too much?! My job is important for the safety and quality of the finished product. At Mauds, we take pride in making the best ice cream every day. I would say producing ice cream from start to finish is a complex process, like a really tasty science. It is a career worth pursuing. This is going to turn from a job to a lifelong passion; get ready for an adventure. Perseverance, a good attitude and a willingness to try something new. You never know where it could lead.